Booster Station at the corner of N. Buckeye and Spring Streets in Wooster. 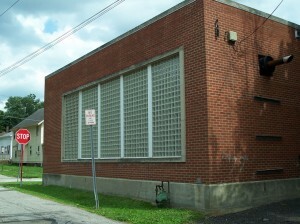 The City of Wooster’s Waterworks Booster Station sits quietly at the southwest corner of North Buckeye and Spring Streets. The industrial, rectangular brick building looks slightly out of place amongst the residential neighborhood that surrounds it. Many people drive by the Booster Station and wonder what it is, as there is no sign that indicates it is Wooster City property, or a part of the city waterworks system. As a student attending Grant Street Elementary School in the mid-1970’s, I remember a field trip in which our class walked over to the Booster Station and a city employee kindly opened the facility, gave us a tour and explained the purpose of the Station was to pump or boost water from the lower elevations to the higher elevations within the city. I remember being impressed by the size and number of brightly painted light blue pipes that arose out of the ground and then curved back down into the ground, looking like a row of giant upside down U’s. After discovering a number of articles published in the Wooster Daily Republican newspaper between the years of 1918 and 1920, the early struggles the City of Wooster went through to find a good water supply and putting a system in place to deliver water to its growing population were revealed. The story behind the Waterworks Booster Station is but one struggle of many, the city faced to get water to it’s citizens. Even before it was ever built the Booster Station had a rocky beginning: the residents, living in the area of North Buckeye and Spring Street in May of 1918, did not want the Station to be located in their neighborhood and petitioned city council to locate it elsewhere. However, city council turned down the petition and authorized City Service Director, H. H. Miller, to appropriate a 35-foot wide and 54-foot long strip of land belonging to a lot owned by Anna E. Hughes on North Buckeye and Spring Streets. Mrs. Hughes was about to close a deal to sell this lot for residential use when the sale was abruptly canceled after the buyer found out the city intended to appropriate a portion of the land, despite the fact that enough of the lot would be available for a house to be built upon. City Service Director Miller initially offered Anna Hughes $600 for the strip of land, which she turned down, and then he offered her $700, but she would not budge from her $1,200 asking price. The city was forced to take the matter to Probate Court, where on June 25, 1918 a jury consisting of W. F. Ebert (Wooster), Finley Franks (Franklin Twp. ), James Fishburn (Plain Twp. ), S. O. Eschliman (Baughman Twp. ), Z. T. Hobbs (Baughman Twp. ), Elton Franks (Franklin Twp. ), W. O. Weiser (Wayne Twp. ), Raymond Martin (Salt Creek Twp. ), Grover Saunders (Franklin Twp. ), J. K. King (Apple Creek), W. H. Landis (Chester Twp.) and Henry Haller (Wooster) were asked to return an assessment of the value of the property. Wooster City Solicitor Walter Mougey represented the City, while Mrs. Hughes hired the firm of Kean & Adair as her attorneys. Thirteen people were called to the stand to testify and voice their opinions on the value of the land. It was reported that the estimated values ranged anywhere from a low of $429 to a high of $1,500. The jury came to a final decision on the value of the land by recording the estimates made by each of the people that testified, adding them all together, then dividing the total by 13 to strike an average. Which came out to be $605.07 for the value of the land. 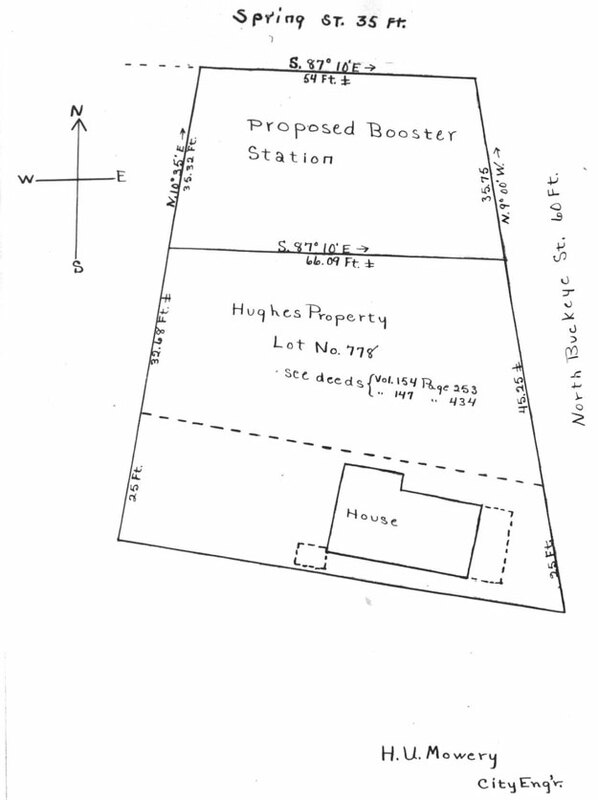 However, they also decided that the value of the remainder of the lot owned by Mrs. Hughes would be damaged and ultimately lower because the Booster Station, after it was built, would be in such close proximity to any house that would be built on the lot in the future. They decided to award her $400 for damages to the value of her remaining section of the lot. 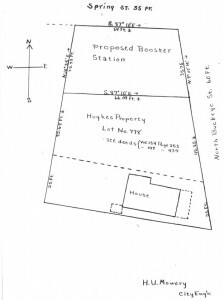 So, the City of Wooster, in order to purchase the land, had to pay Anna Hughes $1,000 for the 35-foot by 54-foot strip of land upon which the Booster Station now stands. J. C. Smythe would build it for $3,033.09; and Long & Bogner reported it would only cost $2,805. Side view of the Booster Station along Spring Street. The construction firm of Long & Bogner was awarded the contract and by August 22, 1918 the paper reported the concrete foundation, which was 4-feet deep and 16-inches wide, would be completed by the end of the week. Brick for the superstructure was already in the city and being hauled to the construction site. Wooster brick was to be used for the inside walls and a fancy brick for the exterior. It was estimated the building would be completed in 30 days. Gangel Construction Corporation, Akron, submitted two bids of $2,650 and $3,000 for different types of pumps; Allis-Chalmers Co., Cleveland, bid $2,585; and Dravo-Doyle Co., Pittsburgh, bid $2,920. By August 28, 1918, the Manistee Iron Works of Manistee, Michigan was selected to supply the City with the pumps and motors for the Booster Station. The contract for installing the machinery was awarded to the Gangle Construction Corporation of Akron, Ohio. However, the pumps for the Booster Station did not actually ship to Wooster until late February 1919, and the two motors did not arrive until mid-April of 1919. Once all the parts arrived, the Gangle Construction Corporation set about installing the machinery and believed the Booster Station would be ready for operation the first week in May of 1919. The Booster Station was able to start drawing and pumping water from the Apple Creek south of town to the Bloomington Reservoir by June of 1919 as the city waited for the new Killbuck Valley water plant to become operational. 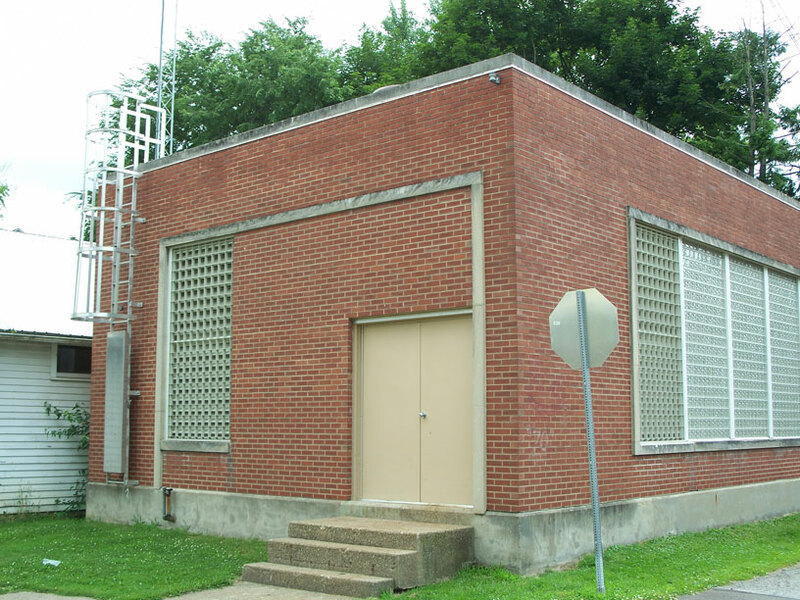 It was noted in 1920 that during an emergency situation, water from the creek could be pumped into the Bloomington Reservoir through the Booster Station upon fifteen minutes notice. Though the Booster Station was completed and functional by mid-1919, city officials did not officially accept it as a completed project. They felt there were a few things that did not meet the requirements of the contract and waited until the contractor fulfilled those obligations before the city formally announced the Booster Station as, “above the mark set in the specifications” in January of 1920. Waterworks Superintendent and Street Commissioner John Taylor completed the beautification of the Booster Station by grading the grounds, preparing to lay the sidewalk, and seeding the grass in May of 1920. The only problems ever registered with the city by residents living in the area once the Station became operational were several complaints that a noise generated by the Station was becoming very annoying in their cellars. While the machinery’s noise was not noticeable outside the Station it could be plainly heard in several cellars and was apparently being transmitted through the water lines coming into the cellars. To rectify the situation Service Director Miller and Waterworks Superintendent John Taylor placed dresser couplings with a rubber-band on them on the water lines entering the homes affected by the noise that eliminated the problem. “The City reinvested approximately $2 million in a retrofit/upgrade of the station in 2008. The pumps, back up diesel pump, electric motors, controls, etc. were last upgraded in the 1940/50s and were all updated to current technology and newer equipment. The Buckeye Booster Station (as we now call it) is designed to move water from the City’s ‘Low’ zone into the ‘Intermediate’ zone and more specifically, to fill the water tower at the Wooster Community Hospital and the new tower on Oldman Road. While its role within the city’s waterworks system has changed and been adapted to meet the city’s needs over the years, the Booster Station on the corner of North Buckeye and Spring Streets has been faithfully pumping water for the residents of Wooster for 91 years and is expected to remain an integral part of the city’s waterworks system into the future. Written by S.Zimmerman of Wooster, who volunteers to serve as the webmaster for Wayne County Historical Society.